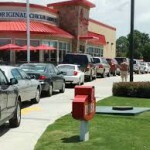 Once a customer has entered your drive-thru lane, there is nothing more critical to optimizing your bottom line than your drive-thru Digital Menus. In addition to spelling out what’s on the menu, they also need to covey what today’s special offer is, and the overall layout needs to be carefully construed so as to nudge your customers to spend just a bit more at your QSR than he might otherwise have intended to. And, if you advertise or if your organization is composed of more than one location, the style displayed must be consistent throughout to support your brand. Vertically oriented drive-thru Digital Menu Boards have proven to be the most effective with customers, and most peoples’ attention tends to focus on the right side of the board, so that’s where to place items that you want to quickly move. If for whatever reason you do end up deploying a horizontal Digital Display, the “sweet spot” for this variety is in the very center of the board. Your car-side drive-thru Digital Displays will, by their nature, be smaller than those in your dining room, so it’s important to carefully choose what to highlight. And, your customer has to devote much of her attention to safely operating her vehicle, so you’ve got to make it as easy for her as possible. Clutter must be avoided at all costs, and items that are similar to each other should be displayed adjacently. At the same time, you need to present a consistent message to your customers, so despite the size differential, the inside and drive-thru Digital Signs should be stylistically similar. Nowhere does the phrase, “one picture is worth a thousand words” carry more weight than it does with food. One of the great advantages of Digital Signage is that you can not only display pictures, you can also display videos. Use that advantage! Images of cheeseburgers dripping cheese or of a happy customer biting into that pizza will reach out to your hungry customers in the drive-thru queue, and they’ll reach for their wallets in order to satisfy their craving.